Whether you call it a security blanket, blankie, or lovie, they’re just cute. I think I made this more for me and the sake of making one than for the boy who currently, at 5 months, doesn’t quite appreciate it yet as one of his precious toys. Give it time though, I’m sure he’ll want to snuggle with his ninja soon enough. 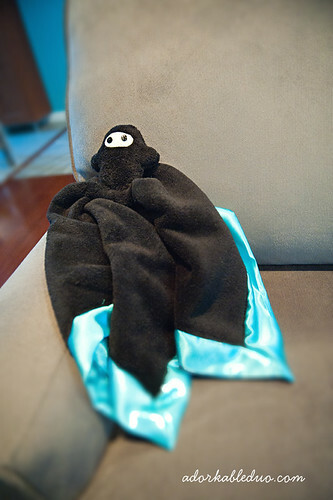 I mean, there’s no more security than a small blankie with a ninja attached to it. 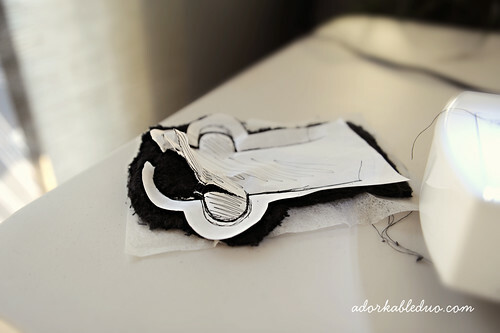 interfacing… or reuse a dryer sheet like I did! I essentially combined two of my tutorials to create this lovie. 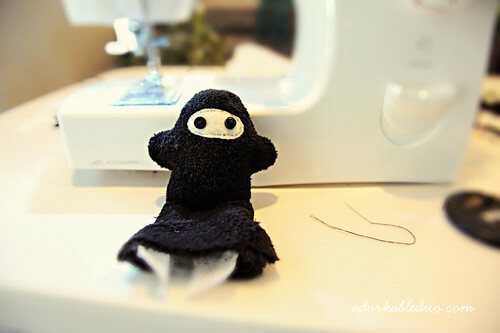 Once that was complete, I moved onto the second tutorial and made a smaller ninja. Since the stuffed ninja was smaller than the plushie I made and the fuzzy material was black, I pinned and sewed both sides together WITH the template I made out of paper in order to see what I was actually sewing. 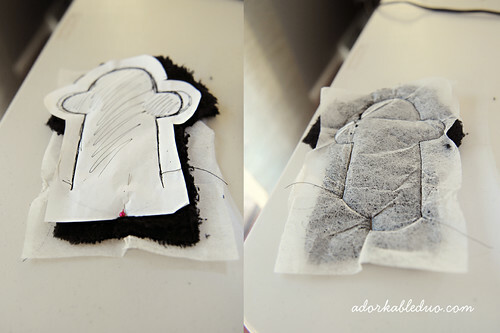 Note: one side had the paper template and the other had interfacing (dryer sheet). Paper can be easily sewn through and after you’re done, you can just rip it out, much like if you ever ripped out a tag from your shirt. Turn the ninja or whatever stuffed object you made rightside in and stuffed him with batting. Then, sew line across the entire bottom to keep the stuffing inside. Fold the bottom up and pin it shut. Run some hand stitching across it to finish the bottom edge. 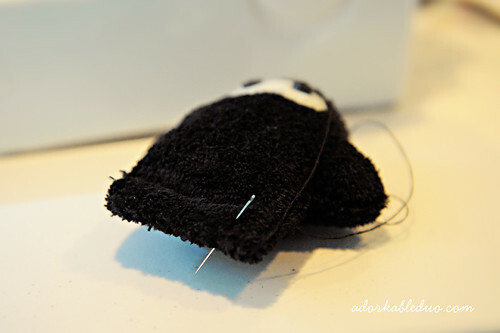 The black fuzzy material made it very easy to haphazardly do this while hiding the messy stitches. THEN, the fun part was pinning the ninja to the middle of the blankie you made in part 1 above and securing everything with your machine. Remember, babies will tear this up, so be generous with the thread and run the sewing machine forward and in reverse. 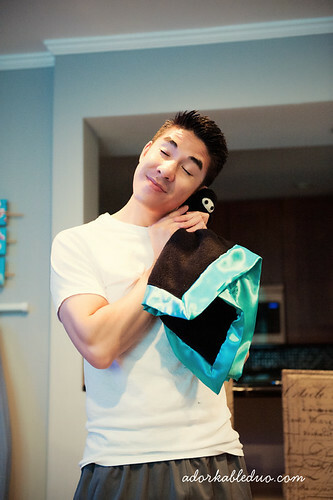 And here’s my dorky husband demonstrating how the boy will probably snuggle with it one day. Hey!!! I was excited to find your tutorial because it’s really hard to find tutorials for these types of security blankets. My big question is regarding the last step – how do you secure the ninja to the blanket? Do you cut a hole in the blanket and finish the edges somehow? I’m stumped on this very last part! No hole! I literally folded the blanket part in half along the diagonal and sewed the ninja to it in the middle… Several passes of sewing to secure. I didn’t cut a hole so that there would be less of a chance for ripping! Did you sew the head on with the machine or by hand?